Wishes and Dreams--It's All About FIBER! : MORE FLEECE...MINGLE...I REALLY ENJOY DOING ALL THIS! MORE FLEECE...MINGLE...I REALLY ENJOY DOING ALL THIS! 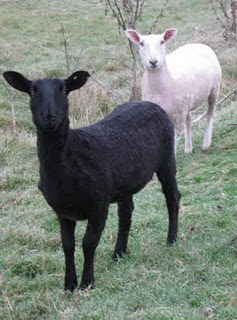 This is a photo of Mingle, a black border leicester sheep. This is the first shearing for her, so it's interesting to see the difference in a lamb fleece vs. fleece from an older sheep. Long, silky, lustrous, those are just some of the words...beautiful. There is alot of color variation in this first shearing as you can see from some of the photos below, a lot of brown tips & even some gray! It's going to make a beautiful mix. After combing, the color is really blending in well. I can't wait to see some of this spun & plyed. Sorting locks to be washed, note the color variations. The flash was really bright here but it reflected off the brownish bits in the fleece so maybe you can get an idea of what it really looks like. A much darker photo, although you can still see some of the color variation. I a thinking of making this into the Rhinebeck cardigan if everything works out. We will see!